During the 19th and early 20th centuries, the modern boxing ring was introduced and codified rules were put into place. These included the rules that the fighters should wear western gloves and cotton coverlets over their feet and ankles. Many of the old techniques were either banned or became impractical for the new type of matches. form was referred to as muay boran or ancient boxing. Traditionally, Muay Thai masters would teach the techniques of muay boran to advanced students but this is not often done today. Professional boxers consider it a waste of training time for them to learn techniques that they won't be able to use in competitions and tournaments. Even in Thailand it is becoming increasingly difficult to find a school willing to teach it; they prefer to focus on "modern" Muay Thai, as this is more easily exploitable as a form of income. 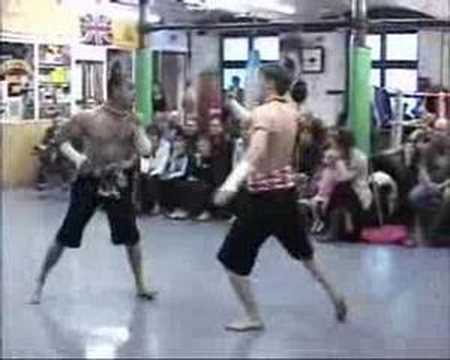 In this clip, two practitioners demonstrate Muay Boran; it looks pretty much like Muay Thai though Muay Boran is supposed to be distinguished by its low stances and long bridges. Oh great, a WWF version of Muay Thai. There's good athleticism here, but there's not much else to be said except that the acting gets worse the longer the clip goes! lol, it's a highly theatrical isn't it. but you have to hand it to the boys, it's far more realistic than the two (or more) man wushu demos we have on file. hope readers can see beyond the acting to the techniques itself. in traditional martial arts, play acting is actually a bit more important in combat training than most people may realize. thanks for your comment.